Hi Everyone! 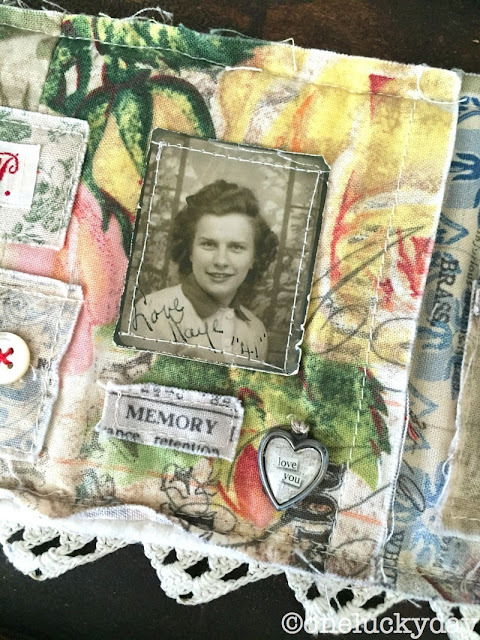 Glad to be back at blogging this week and sharing my Memory Spool. 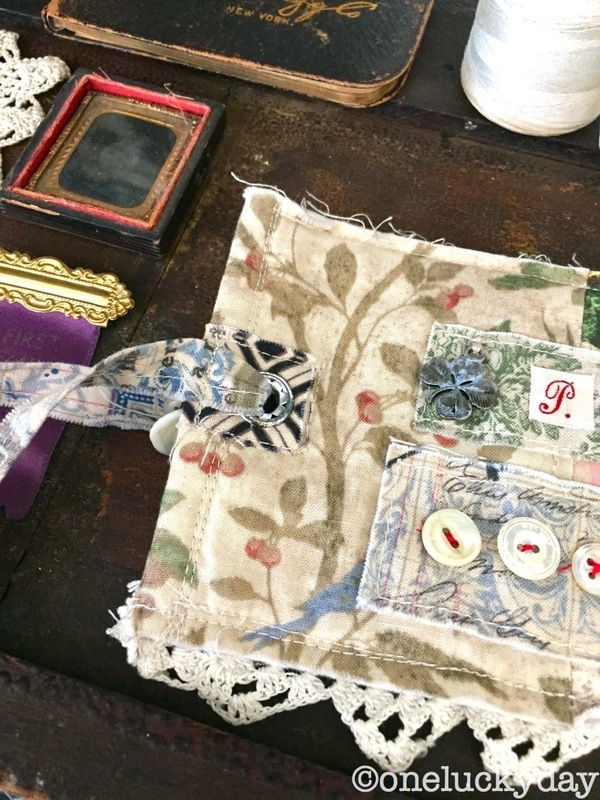 This kind of no fail crafting makes me happy (as well as relaxed) because there is no wrong way to make one...so even if you can only sew a straight line, you've got this. 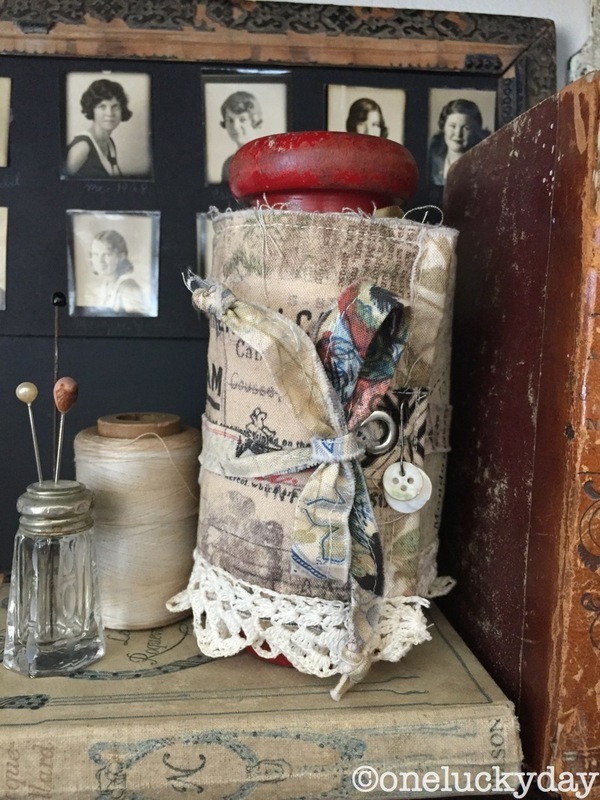 The Memory Spool project started with a small spool found in a local junk shop. It stands about 6" tall, end to end. The spool sat around in my craft room for quite a few months before I figured out what I wanted to make (that kind of thing happens all the time around here). I created 2 fabric pieces 4 1/2 x 19" to fit the spool. I say "created" because I sewed random scraps of fabric from the Wildflower line together until I had two pieces the correct size. Some are sewed together with the seams showing and some were sewed as patches right over the top. The only rule was that it had to end up the right size! I purposely used the Aviary fabric on the outside portion that would show when closed because of the red writing that says, "my dearest". Once I had the two pieces ready, I layered them with Warm and Natural batting and then top-stitched at the top and bottom. 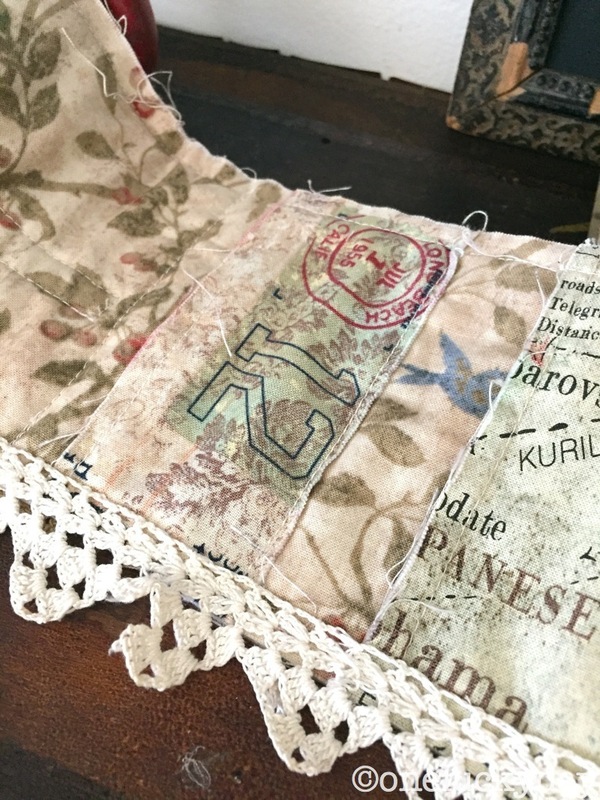 The antique lace from an old pillowcase was sewn along the bottom edge. I still needed a way to secure the roll... so I decided on a grommet I could thread a long strip of fabric through. I picked up the grommets at Joann Fabrics (super easy to put in with a small hammer). 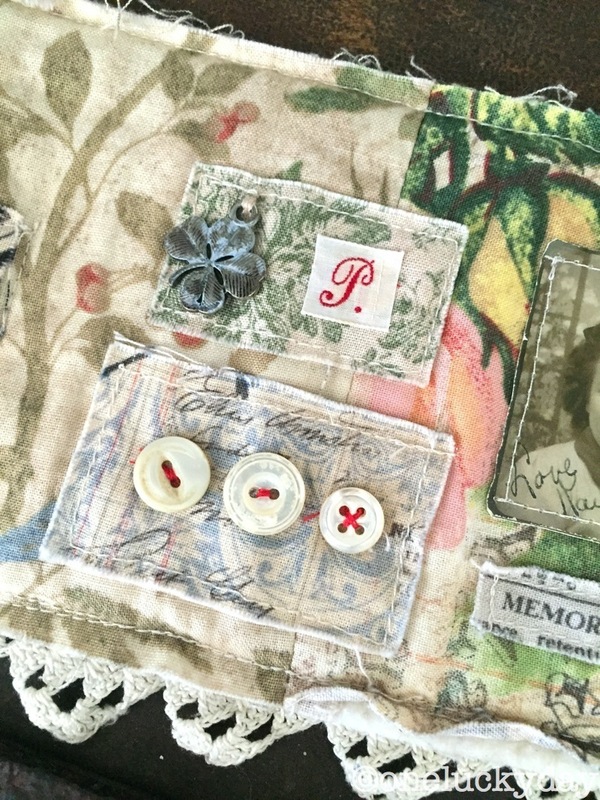 The clover from the Souvenir Adornments pack (paint and alcohol ink added), the 'P' is fabric tape from the Paris flea market, mother of pearl buttons (gotta have good buttons)! I used a Photobooth image and just sewed right through the paper. 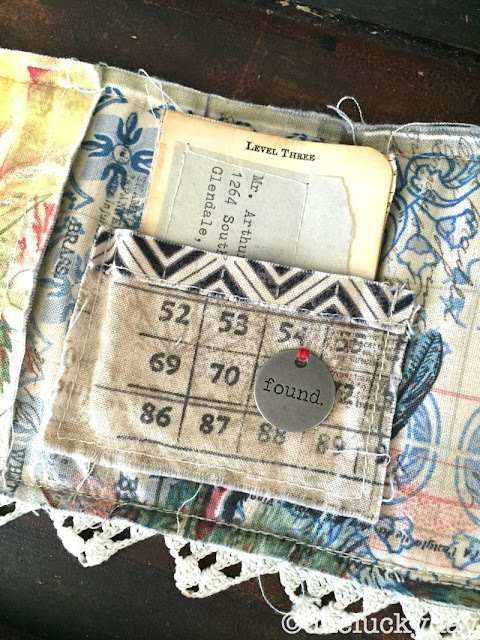 The word memory is cut from the Eclectic Elements fabric Dictionary and the heart is of course a idea-ology Heart Charm. 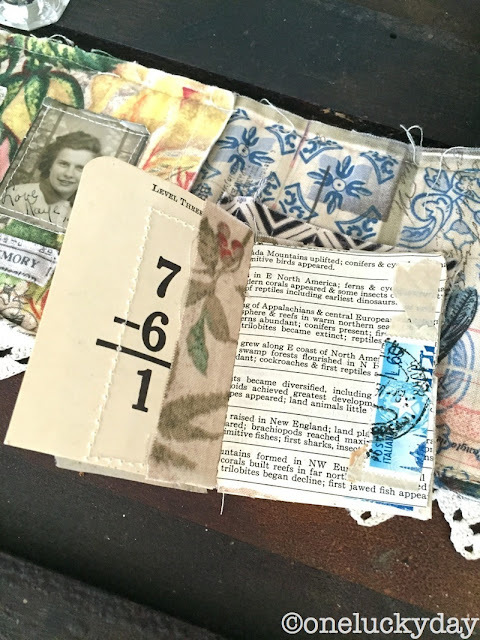 Next I stitched a little pocket to journal memories (with an added Type Charm). I made the book using an old flashcard. 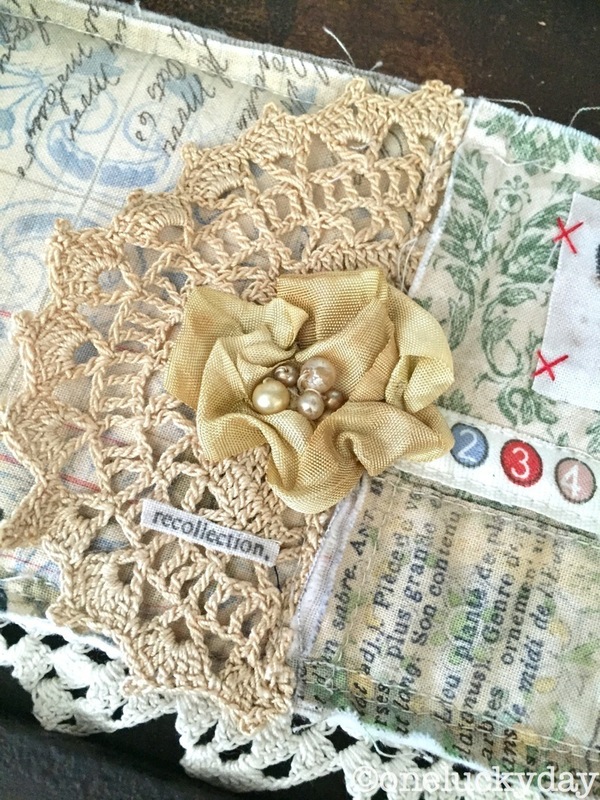 In the last section I added part of a doily, dyed Crinkle Ribbon and various pearls cut from old necklaces. You can also see how I secured the fabric roll to the spool with more Crinkle Ribbon. 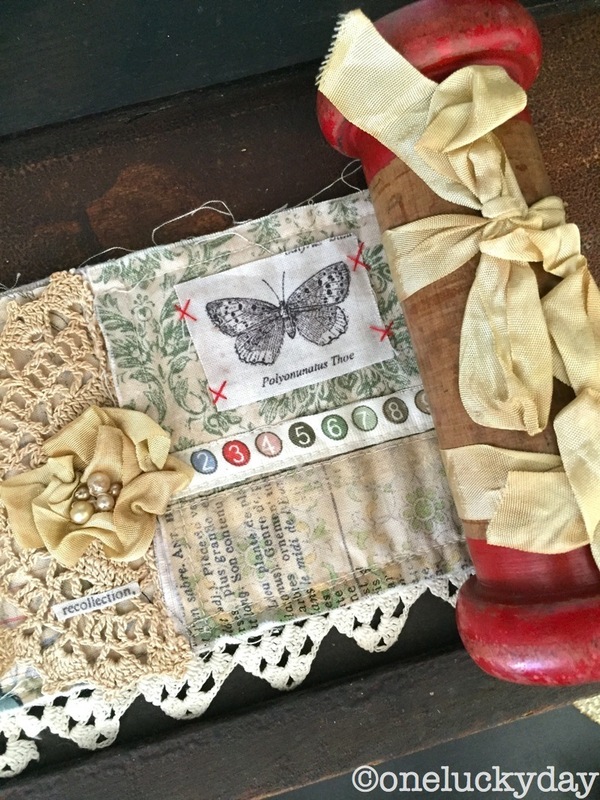 The word "recollection" comes from the Dictionary fabric and I just glued it in place. As I said before - I love this project because it's an open door to explore. No worries about seams or strings...and if you forgot to add something, just top-stitch it on! Wish paper was that forgiving! Hope you will try something like the Memory Spool! Maybe even a fabric book to add your memorabilia to. 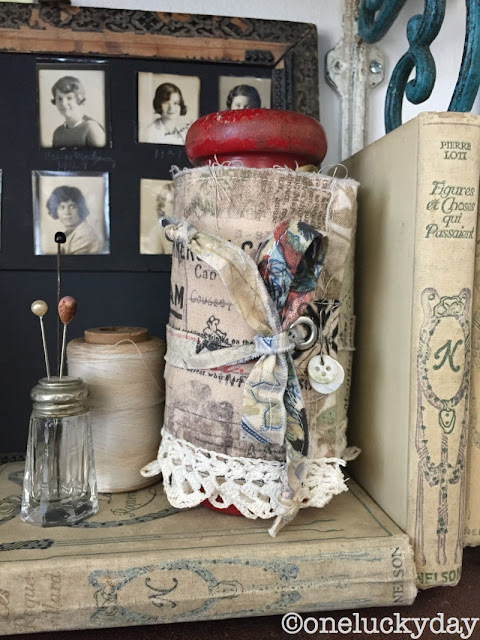 I am quite sure Pinterest has much on the fabric book subject for ideas to get started! For those of you who do not have a local store to purchase fabric or to just check it out...here's a link to the Aviary fabric. I also have to give a shout out to Whim So Doodle in St. Petersburg, FL. They are the only scrapbook store that I know of with an in-house fabric store next door. 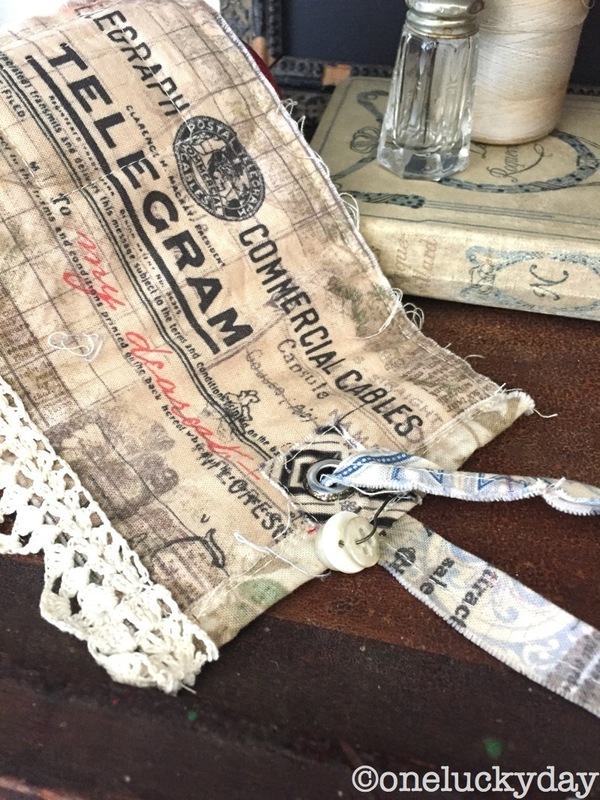 They carry all the Eclectic Elements Fabric and they ship! This is so beautiful Paula. I love all the pockets and charms and buttons. I'm totally in awe! I LOVE this! It reminds me of the little thread spool you did with Christmas paper a few years back. I made one with a kit you had in your shop. It's awesome! What a lovely piece! TFS Paula! This is so beautiful! Being a hand stitcher this would be a totally different endeavor...doing photos on fabric... Very tempting. And your fabric choice is perfect. Thank you for sharing. Sublimely creative!!! I LOVE all the elements you've added, and the stitching is wonderful! 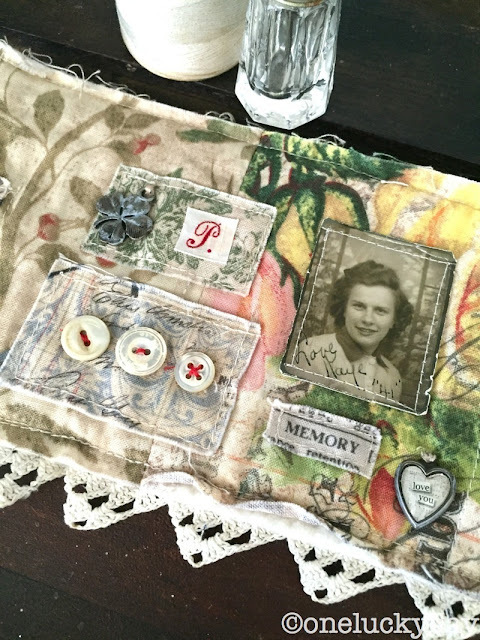 What an awesome idea, and can be applied to any significant memory!